Copyright: The participant grants the organiser and any partners commissioned by the organiser (e.g. editorial teams and agencies) the perpetual, non-exclusive, royalty-free right to use and publish the submitted image files for the purposes of the competition, for print and internet coverage of the competition, for public relations work relating to the competition, posters, invitations, exhibitions and, if applicable, catalogues and books or similar material. As the theme suggests, this competition is dedicated to love and affection for our fellow human beings. What is it about them that we like, admire and adore so much? Is it their actions, their words, or just the simple fact of their presence? Personality, shared experiences and situations can all contribute to shaping the feelings that people inspire in us, and the force of love and affection can manifest itself in countless different ways. Our focus will be on the following questions: What is it that we love so much about people? How do these feelings express themselves? And how can we capture this love and transcribe it photographically? Image requirements: JPEG format; under 1 MB in file size; longer side should be no greater than 1024 pixels. Online submission of digital photographs via the website. 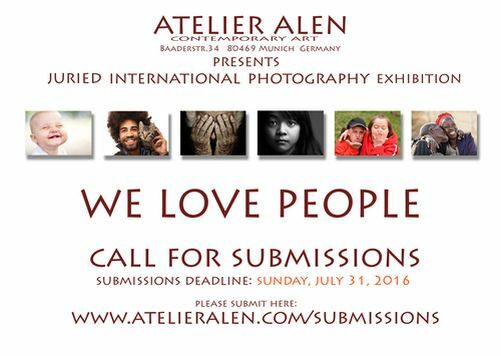 The winners of the competition will be offered the service of having their photos printed for exhibition by Alen GmbH. This service is subject to a charge.